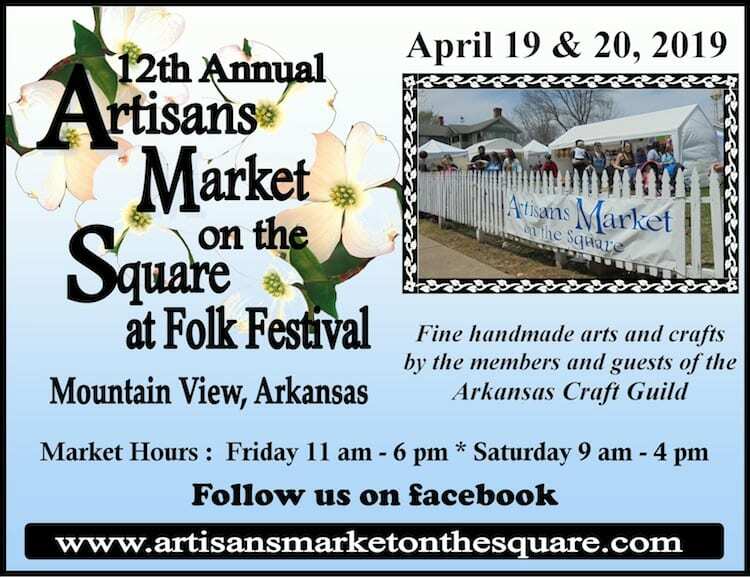 The 12th Annual Artisans Market on the Square at the 57th Annual Arkansas Folk Festival will be held April 19 and 20 in Mountain View, Arkansas. Excellent handmade arts and crafts by members and juried guests of the Arkansas Craft Guild will be available only behind the white picket fence on Washington Street north of the Courthouse. Hours are Friday 11 and 6, and Saturday 9 to 4. Wood carving, turned wooden bowls by Liz Lloyd, jellies and mixes by Ozark Pantry, handmade knives by Lewie Lloyd, flameworked bead jewelry by Sage and Tom Holland, Beau Anderson, as well as by Maria Smith. Other regulars attending, goat milk soaps and lotions from Tammy Sue’s Critters, Norma Mathews quilting and woodworking, chenille kitty pillows and home decor by Doris Fountain. Cigar box novelty guitars by Flying Pig Guitars, functional pottery from Greg Hall and new member Alexis Barber will be available for your shopping pleasure.